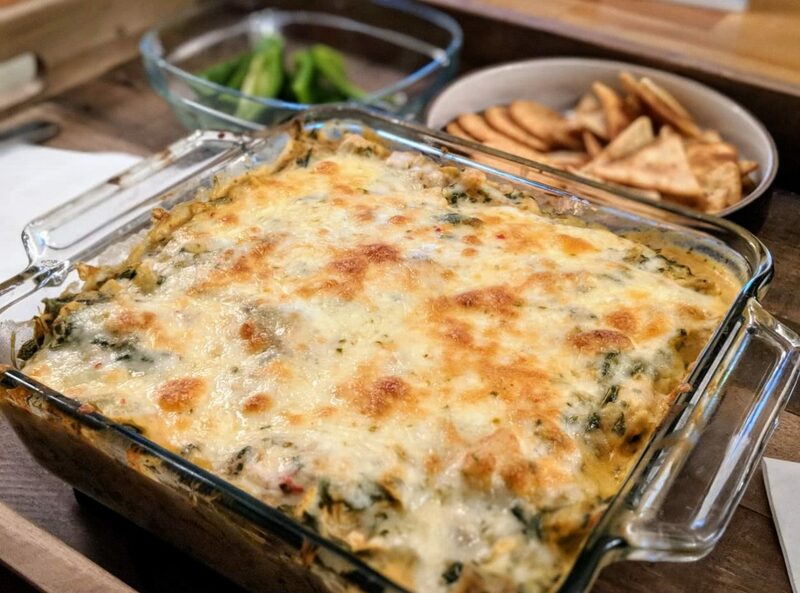 Spinach and Artichoke Dip is a timeless classic, and it is hard to find someone who does not enjoy the indulgent and cheesy concoction. This recipe "lightens" up the classic by adding pureed white beans and some spicy seasonings. This artichoke dip is served best alongside pita chips and crackers, but it can also be enjoyed with a medley of vegetables. Prepare the base of the dish and get all of the ingredients ready to go, as the cooking process goes very quickly. Dice the onion, mince or chop the garlic, run a knife through any stemmed or large leafs of your greens. Drain and chop the artichoke hearts and set aside. In a food processor, puree the drained and rinsed white beans and set aside. Preheat the oven to 400 degrees Fahrenheit. Heat the olive oil over medium high heat in a large cast iron skillet and add the onions. Saute until translucent, about 5 minutes, adding a large pinch of salt. Add the garlic and saute for about a minute. Add the greens to the skillet until they begin to wilt and cook down. Stir frequently to get the excess water to evaporate to ensure the dish does not get liquidy. Reduce the heat to low and add in the artichoke hearts, pureed white beans, cream cheese, yogurt, and parmesan cheese and mix until it is thoroughly combined. Transfer the mixture to an 8x8 baking dish and top with the grated pepperjack cheese. Bake for 15 to 20 minutes, or until the cheese on top has browned in spots. Remove the dip from the oven and allow to cool for 5 to 10 minutes. Spoon into plates and enjoy alongside any dippers!